This one is a bit of an oldie, i made this layout before the TLMC#4 and from this layout came the idea that i would re-use later in Foxtrot Labs, many other interesting ideas are used here too like the buildable terrain behind the natural bases or the bushes where units can be hidden in the middle of the map. The layout is quite open compared to other of my newer maps, but it makes for great positional games. Again i hope you guys enjoy the map! hfhf! This map does not has GameHeart yet. 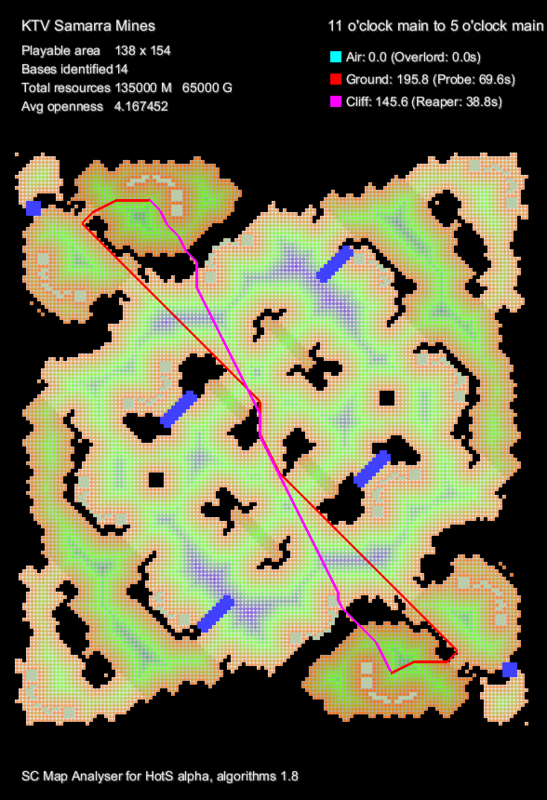 ◙ Forward Third/Four base has rocks behind the mineral line, <7 range units can't reach the mineral line. 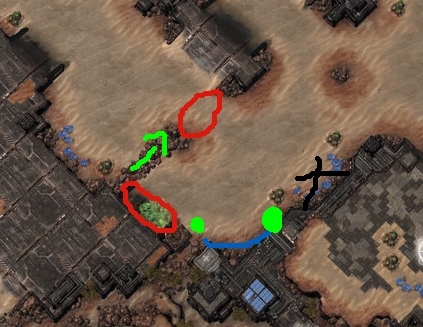 ◙ Main base has two reaper/Smart Blink paths. Those aesthetics. So good bro. Layout is pretty bland , but i suppose its me being obsessed with a lot of ramps in my maps :|. Overall still great map , you are definitely the better mapmaker this summer ! The bottom left corner is cut off by the way. Really digging the layout. The choice of having a lot of space behind the main mineral line is interesting. I guess if you play terran, a lot of your units will stream past your CC. Makes things easier to defend, I suppose. Cool! I won't call the layout "bland" in the slightest. 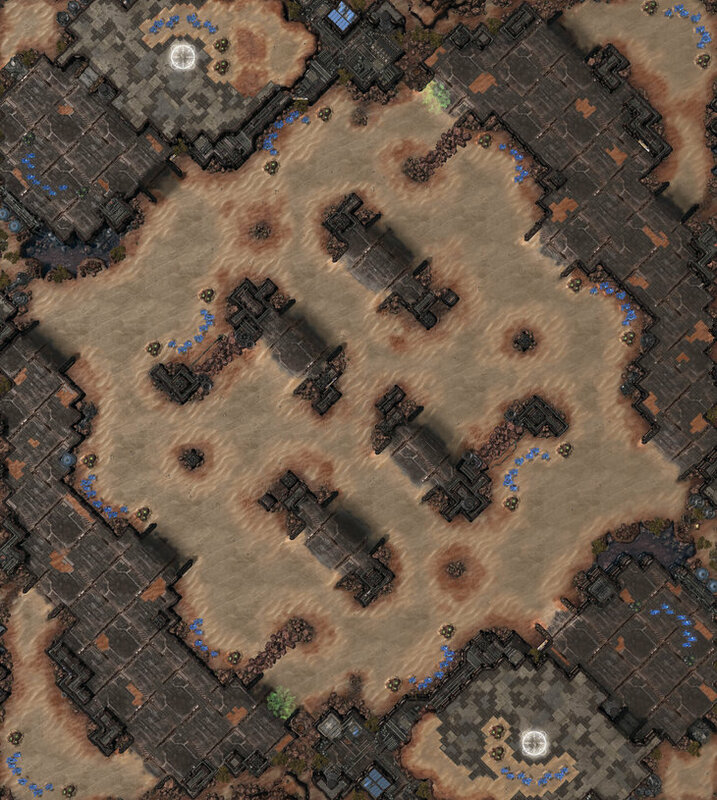 This wuld be a pretty revolutionary map for today's SC2. As the players take more than 2 bases each, they find themselves on a level and very open plateu - there is not a lot of positions to get positional advantage - and the highgrounds behind the side bases are outright vicious. On one hand, this is something that current SC2 needs, on the other it would probably lead to a lot of 2 base allins in any Protoss matchups at least. while a beautiful map, only expect a lot of 2 base play because the bases outside your natural are really damn hard to take. The eye gets tricked by all the padding of different colors into thinking the spaces aren't quite so big as they really are, and the ridges in the center appear very important because they're visually distinct where in actual games I don't think they'd be used that often. I really like this take on bw-style open middle, though. And great texture work, obv. I like this map, it seems like a World War 1 styled "trench" map? where there are various terrain features in an otherwise open map. Reminds me of an EW map as well. I think third should be more defensive, so that it gives the defender a bit of an edge even if u have to make it further away. the EW map had this problem as well. Other option as you say Semmo would be to move the diagonal rocks to the other side of the path likes this, add a set of diagonal rocks blocking the ramp leading to the third and move the mineral line a bit farther, the thing with this fix is that the distance is just far too long and with the current layout/flow of the map i'm not sure it would work as well, none the less making a third like that sounds pretty interesting, so i'll try to mess around with it a bit for future maps. ♦ Reduced the area around the third base, not as much as i said i would because the slightly harder third still makes for fun gameplay, but enough so it should not cause as many problems as it had before. ♦ Fixed small pathing issues around the edges of the map.